Looking over the PDC content for this fall you can definitely see a trend: Cloud Services. This is to counter Amazon's S3 offering. This is a problem, epically for start-ups. You have to build a rack before you even build a company and product. That is expensive and an up-front fixed cost. More than likely you will build a rack that at overcapacity so you can grow, since it is time consuming to add more capacity later on. Also, you usually have to hire people to help you figure this out. Building a rack is expensive and also expensive to maintain. Cloud computing is providing the back end infrastructure, the first two bullets, to firms as a service. The beauty of this model is you pay for what you are using, bandwidth, storage, and clock cycles. So a startup does not have to spend $20,000 on a new rack, they can pay a monthly cost to host their application in the "cloud" and only pay for what they need. In the beginning this will be a small fee since a startup has no customers and then the fee will grow (as revenue grows hopefully!) Amazon S3 is attracting many startups and is changing the dynamics of funding a startup since they don't need as much expensive hardware and IT expertise. So many critics of Microsoft say that they are missing the boat by not putting MS Office up in the cloud to compete with Google Apps. While Microsoft may have to compete with Google one day in this space (I personally prefer offline Office + a service like SharePoint to share my documents.) that day is not today. The real battle will be over the true Cloud-infrastructure and ultimately the stack. Selling customers on your Cloud platform locks them into your technology. So if Microsoft offers storage (SQL Server Data Services), application synchronization (Live Mesh), workflow/relying (BizTalk Services) and application tier (IIS as a service? or at least VPCs) services, they will get developers to use the Microsoft stack (SQL, .NET, etc.) for another generation. Throw in Hosted Office and Exchange, and they are really hooked. 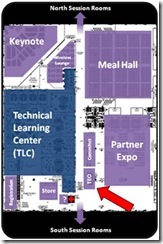 Judging from the PDC content, with sessions all around Microsoft Cloud services, I think that they get it. Too bad we have to wait until October, but I sure hope that it is good stuff. 1. Go Nuclear. Launch an all out court battle against Google-Yahoo starting with a lobbying effort in Washington, DC. We saw how effective Netscape, Sun and Oracle used the US Government to bring Microsoft to heel. (And more recently Google's complaints about Vista.) Microsoft saw how effective (some say Bill Gates was never the same after that experience) the nuclear option is and may just decide to go down this route as payback for both the Yahoo hubris and the old IE trial. 2. Do nothing. Remember how big and bad AOL was 10 years ago? Netscape? They were the hot new kids on the block that was going to dethrone Microsoft. Ten years later, Microsoft is still making buckets of money, revived interest in its development platform with a new push in 2002 (.NET) and AOL is practically bankrupt and Netscape disappeared (oddly enough at the hands of AOL, sound familiar to Google-Yahoo?) Microsoft can argue that the creative destruction of the Internet companies is more of a threat to Google than themselves. The Google model has not changed in 10 years: PageRank is old and outdated (still gives you irrelevant results and forces you to search like a techie). In addition PageRank is being gamed and people are getting frustrated. People are exchanging, buying and selling links on web pages with the sole intent of manipulating search results. Someone will come up with a better system and out Google Google. (Memo, it won't be Live Search.) Microsoft can sit back and develop its Mesh and Cloud computing offerings (Web as a platform) and watch Google struggle with growing pains, more defections, US regulatory issues, and challenges from hot new startups and see where the chips fall. My guess, both MS and Google will come out ok with this strategy. 3. Acquire a large portal. This is an attractive option, but nobody has the eyeballs that Yahoo! has. Only MySpace and Facebook have the eyeballs and they have problems making money. So if you were Steve Ballmer which would you choose? My lunch with Bill Gates yesterday at Tech*Ed in Orlando was very cool. His first word to us was "super" as was his second. After snapping a few photos, we got right down to it. There were about 12 of us from the community who were invited and and we were eager to chat. First question: "Hey Bill, what are you going to do with your free time?" Bill indicated that he is going to be "super" busy and will be working full time on his foundation. We then got into talking about schools and how he envisions most schools around the world to be textbook free and just use computers. Then about how university level learning will be done via the Internet for lectures. In poor countries "best of breed" lectures can be put on DVD and repeated. Bill was blown away by the organic chemistry distance learning made available by MIT and wants to bring this model to everyone. He said that the traditional lecture will die at the university level. He was extremely passionate about teachers, schools, and education in general. I got to finally get a word in edgewise. :) I had lots of questions sent to me by readers of this blog ranging from "What's next" to "Why not just buy the Mets, that is charity at this point." I asked about Microfinancing. The answer surprised me. While Bill's foundation gave $300 million in total to microfinance, Bill said the micro-financing had too high of interest rates and the opportunities to make loans were not as abundant as you would think. Bill had a passion for micro-savings. He said that too many poor people have no access to banks due to distance and bank fees. So banks become something only the rich can have access to in many countries. (Including the US in many regards too, witness check-cashing shops in the inner city.) Bill went on to say how most poor will stash their currency somewhere or buy jewelry, only to get stolen or inflated away. Or some will buy livestock as a way to store their wealth and save only to be stolen or come down with disease. Bill described a system that he worked on that will allow poor people in remote areas to make microdeposits in the bank via a local retailer. Then they can view their balance via that retailer or on their cell phone if they have one. Then can spend the money via local retailers or via an ATM. He also spoke about the need for a quality interest rate for the microsavings. This was really amazing, all you hear about these days is micro-loans, but Bill turned the tables on everyone wants to combine micro-loans with micro-bank accounts. Makes complete sense. The last question by Kate Gregory, was on how does Bill deal with the public sector/volunteer sector's non type A personality. Bill basically indicated that he was results oriented and brings the same passion and project management skills to his non-profit work. I can't say that I had lunch with Bill Gates since he did not really eat, we just kept asking him questions and he never really got to eat his lunch. All in all he spent about 1.5 hours with us and it was great. I have to say that it was really inspirational to talk the whole time with him about non-technical issues (not a single techie question was asked). Here is a man who is one of the greatest technical minds (still!) around, the chairman of a Fortune 500 company, and we talked about his passion for his foundation. I am looking forward to what his foundation will do with him working there full time. Back in September, two classmates convinced me to join them on a crazy quest. 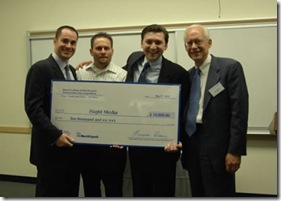 Merrill Lynch and our Business School, the City University of New York at Baruch College, sponsors an annual business plan entrepreneurship contest. For a small team, write a business plan and then show how you can execute. The contest started with an elevator pitch and an abstract way back in September and 140 teams entered. Over the months you have to write a business plan and then sell it to judges who act like investors. The judges cutoff more teams as the months progressed and eventually there were 10 left for a final pitch two weeks ago. By some miracle, my team won! Our concept is all about on-line advertising using a behavioral approach on top of demographic slicing. It is easy to implement and we are going to do so (Watch out Google!) We won a $10,000 cash prize (wow!) as well as $20,000 start-up investment for our business. In today's day and age, with technology so cheap, the Internet so ubiquitous, and overseas resources readily available, we can get to a prototype phase with the $20,000. That is the power of Web 2.5. The best part of winning was being given the "big check" like when you win the Lotto. We took the big check to the bar with us to celebrate, however, the bartender would not cash it.